Come hear Randy talk about making equipment small and less expensive. Inspired Ghost Tracking is where you meet other paranormal investigators and other people who have an interest in the paranormal, ghost investigations, ghost hunting, ghosts, and spirits. We do various events around the paranormal and have guest speakers who are experienced in paranormal, paranormal investigations, and ghost hunters. This is a ghost tracking group that gets together and discuss like minded topics, share experiences, ghost pictures, investigations and to plan some trips to ghost tours, Gettysburg, haunted places, and some ghost investigation work. Anyone with a serious mind for paranormal or would like to know more on paranormal investigations should join. We have had some very nice guest speakers and are planning more. If you are serious about getting together for events and going on paranormal investigations then this group is for you. We meet twice a month, on the 1st Friday of the month we have a guest speaker or plan something else at the VFW Post 160 in Glen Burnie and later in the month we go on investigations, ghosts tours, or anything else that we like to do. 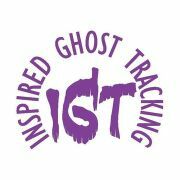 Inspired Ghost Tracking would like to inspire you to learn more on the paranormal, ghost investigations, ghost tours, super natural, ghost hunters, paranormal investigations, and more. Why not get inspired and join today? All suggestions for guest speakers and places to go are taking into consideration just send an email to Margaret at inspiredghst@aol.com. Inspired Ghost Tracking members pay yearly dues of $50. Due to the nature of this group you must be at least 18 years old or accompanied by an adult. By joining this group you are given Inspired Ghost Tracking permission to take and publish pictures of you at our events. You are also giving us permission to hold the copy right of any pictures you put up on our site or take at any of our investigations. Private investigations are done by our core group. If you are looking for someone to investigate your home then please contact us at inspiredghst@aol.com or go to www.inspiredghosttracking.webs.com to visit our other site. Also, check out our Facebook page https://www.facebook.com/inspiredghost/ . "Cool Girls, Hot Events and All Good Times"